Other features for this all-in-one printer is easy to setup into your computer, provides wireless connection, easy to use, it’s quiet and it prints fast. 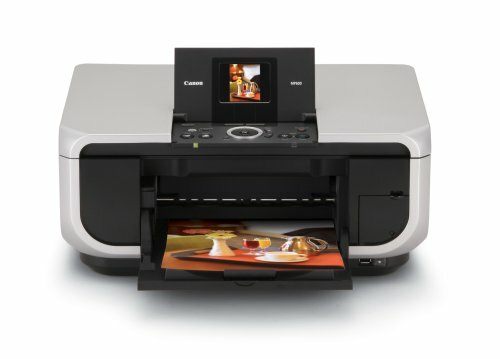 On the internet I’ve found reset method for this Canon Pixma MP600 all-in-one printer, are reset counter and reset the printer to factory default setting. Here the Manual Canon MP600 Printer (Reset Waste Ink Counter and Reset to Factory Setting). Press and hold the Resume Button, add a printer an indicator light green. Press and hold the Power Button, while hold Power button, release the Resume Button. While hold the Power Button, double click Resume button and then Release Both Buttons. Click Resume for Four times. Once you click Power, to confirm the selected action (reset counter absorber). Use the Easy-Scroll Wheel or the right/left arrow to select Settings, and then press OK button. Use the Easy-Scroll Wheel or the right/left arrow to select Device settings, then press the OK button. Use the Easy-Scroll Wheel (B) or the up/down arrow to select Reset settings, then press the OK button. Use the Easy-Scroll wheel or the up/down arrow to select Yes on the confirmation screen and then press OK.
Press the HOME button to return to the HOME menu. Related to "How to Reset Photo Printer Canon PIXMA MP600"
Regarding error messaage A6A00 on Canon PIXMA MP600R I have been surching and surching for a loose paper(bit), however, no paper found. How do I remove the error message, so that I again can use the printer for other purposes? This doesn’t help if the printer doesn’t turn on. Poor instructions/bad English. Used the “Reset Counter MP600” om my MP600R. Now it says error U052 wrong printerhead. But it’s the same priterhead I have always used??? ?